Situated in a dense forest on the banks of the mighty Zambezi River is a truly romantic treasure called Tongabezi Lodge. This exclusive lodge is located 18km upstream from the Victoria Falls on the Zambian side of the border. 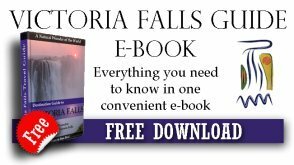 To get there, guests can arrange road transfer from Victoria Falls Airport (Zimbabwe), Kasane Airport (Botswana), Livingstone Airport (Zambia) or the Zambia-Zimbabwe Border. It is also near the Mosi oa Tunya National Park. Guests at Tongabezi Lodge will feel well at home in a variety of accommodation options available there. The first of the rooms at Tongabezi is the Honeymoon House which has an open plan and direct view of the river. The house is complete with a private veranda with sun beds and a private garden. The Bird House also has an open plan and veranda with a deck for private dining. It is unique with a sunken bath perfect for winding down after a day of activities. A more secluded lodging which has its own hidden path is the Tree House. It literally feels like you are living within the Ebony tree which it is built around. 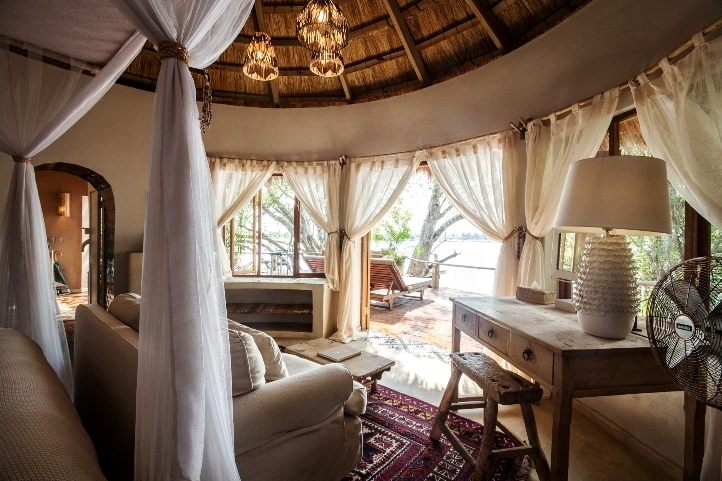 Its open plan lets you experience the surroundings and the Zambezi River without you having to even leave your bed. It is slightly more enclosed and has a private deck closer to the river where you can enjoy sundowners or an intimate dinner. At the far end of the lodge is the Dog House where you are guaranteed views from every space in and around the house. The Dog House is one of the larger ones with a separate lounge and bar, and has large glass windows instead of walls. It is unique in that guests have their own private vehicle with a guide and a boat. 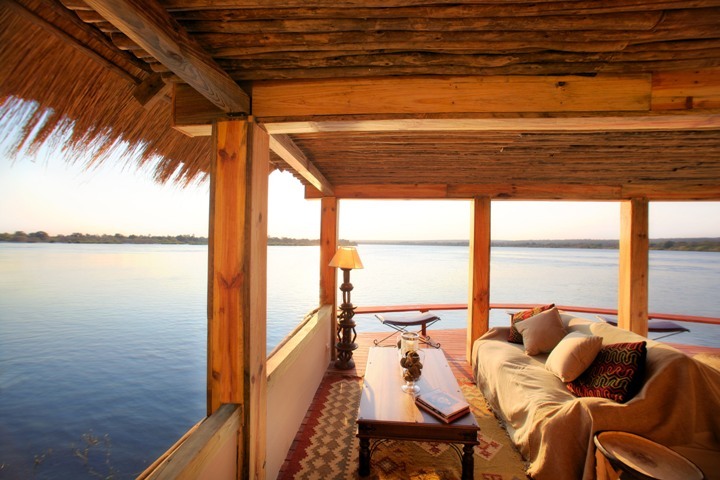 On the other end of Tongabezi Lodge is the Nut House which is elevated on the Zambezi River bank. This house is enclosed with walls that let in light from every direction. It also has its own beautifully sparkling plunge pool out on the deck. Then there is the Garden House – ideal for a family lodging with a double room, master bedroom and lounge with dining room. The Garden House is home away from home, complete with a large green garden, a swimming pool. This house is not river-facing and is more private and safe so that the kids do not go to the river banks unattended. For guests who prefer a more "normal" lodging with closed fronts, there are five River Cottages which all have decks with sun beds to enjoy the view of the river. The main communal building of Tongabezi Lodge is open-sided, facing the river with dining area with long table and lounge area. Dining is al fresco on the deck, in the dining area, or in private dining spots scattered around the lodge. Another shared area is The Lookout – a two storey open-fronted structure built on the deck right over the edge of the river. This is where guests can use the computers with internet, lounge and take in the view, or have a dinner party. At Tongabezi Lodge, guests will experience real pampering in the bush. Besides the luxurious accommodation, there is a private valet who will take care of all your dining, activities and making sure that your stay is as comfortable and enjoyable as possible. 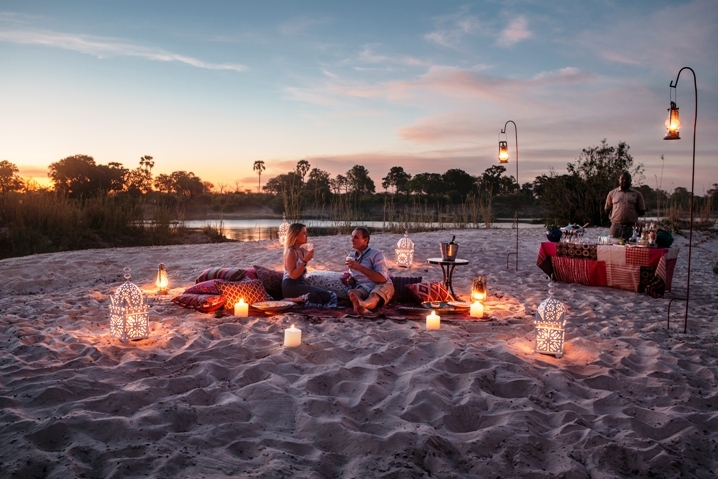 The lodge also offers a “San Pan” candle-lit dinner on a large wooden platform right in the middle of the Zambezi River, with your own waiter to tend to your meal. Spoil yourself at Tongabezi’s health spa which offers massages, reflexology and Shiatsu. 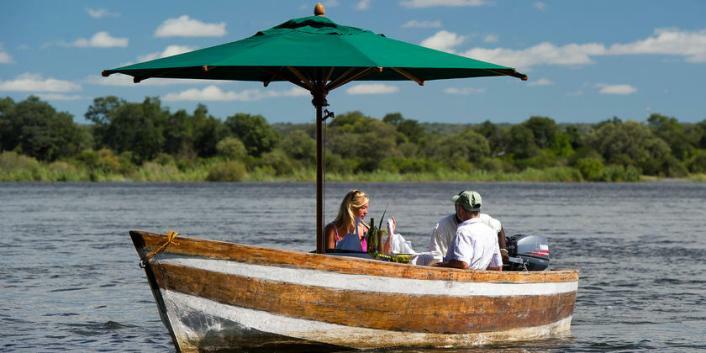 Other activities offered at Tongabezi Lodge include river cruises, canoe excursions, trips to the Victoria Falls, fishing trips, game drives, nature walks, shopping and cultural excursions. The lodge founded a school which it continues to support through its work at the lodge and contributions made by the guests of the lodge over the years. The lodge continues to support the community by employing mostly Zambian nationals, which also gives guests a taste of Zambian hospitality. Tongabezi Lodge puts emphasis on romance, relaxation and rejuvenation. There aren’t very many animals in that particular area although you may get visits from hippo or elephants at the lodge. However, the Mosi oa Tunya National Park is close by and you may see animals during your game drive. Also, the price of staying at Tongabezi is on the high end, but you get real value for you money with all that is included in the rates. This lodge is quite pricey, but you will get excellent value for your money. For a romantic getaway, Tongabezi is a great lodge and is close to the Victoria Falls. • Activities at Tongabezi Lodge: Canoeing trip; Sunrise and sunset cruises on the Zambezi River; Lunch on local private island; Private dinners on pontoon in the middle of the river (with your personal waiter) – “San Pan” dinners; Village visits; Guided bush walks on local island; Game drives in the Mosi oa Tunya National Park (park fees surcharge); Fishing (equipment included); Victoria Falls visit (park fees surcharge); Gorge hike below the falls; Museum tour (Museum fee surcharge); Market visits/shopping trip. Other activities and transfers to those activities are booked at the client’s expense. • Warning! There are no fences on the river’s edge at Tongabezi Lodge and animals such as crocodile and hippo sometimes come out of the water to roam the grounds, so parents should keep their children close. The swimming pools also do not have fences and children should be watched at all times while swimming.